Discovered in 1871 by P.J. Hjelm in Uppsala, Sweden. Molybdenum is a lustrous, silvery colored metal which has an abundance of 1.5 ppm in the earth's crust. In many instances, it shows a resemblance to tungsten with which it tends to be paired in the transition series in the periodic table, but their chemistries tend to show more distinct differences than might be expected. Molybdenum has a high melting point and applications for the pure metal take advantage of this; for example, the pure material is used as resistance heating elements in furnaces, as filament supports in electric lamps, and as electrodes for mercury vapour lamps. Molybdenum is used as an alloying agent in certain grades of steel, Permalloys and Stellites (a series of alloys which contain varying proportions of Cr, Co, W and Mo, are very hard and are used in cutting tools and to protect surfaces subject to heavy wear). 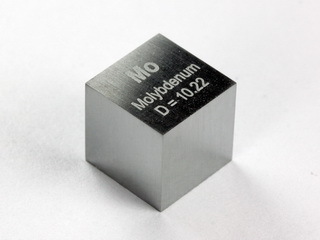 MOLYBDENUM - precision density-standard cube 1cm3 NEW! Using finest materials, each density cube was lapped to 10x10x10mm by a mechanical engineering company with an accuracy of 0.01 millimeter. Each one separately ground and polished it represents the theoretical density of the respective element by its weight. The weight is not affected by the laser inscription. Information such as element symbol, name and density is durable burned at the surface. Each element even shows its specific characteristis in colour and reaction with the laser. Altogether 25 elements are planned in a complete set in a wooden case.